I attended a gift auction two weeks ago with some girlfriends, and I volunteered to bring a dessert for our table. I wanted to bring something that encompassed a variety of desserts such as fruit and a sweet treat such as cake or cookies. But I didn't want to bring several items as I knew we had limited space on the table. I finally decided on dessert kebabs. They are a combination of healthy and indulgent. And boy, were they a big hit! 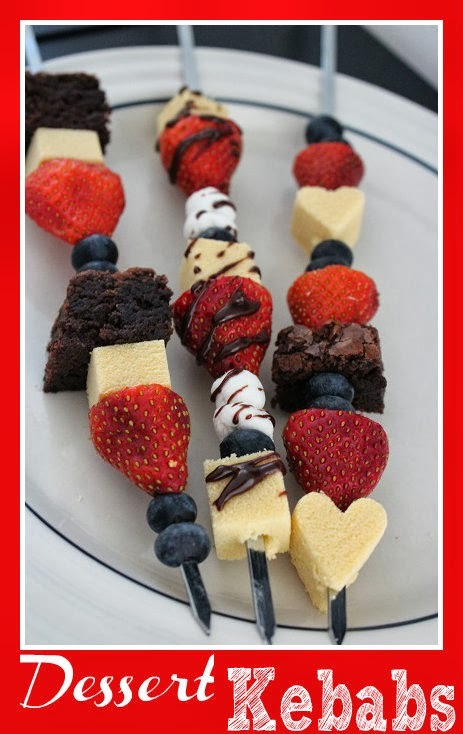 Dessert kebabs are super simple to make and you can use a variety of different and tasty items, as long as you can easily glide them on to a skewer. For this particular occasion, I used blueberries, strawberries, pound cake, brownies, and mini marshmallows. With Valentine's Day just around the corner, I got a bit ambitious and used a small cookie cutter to shape some of the pieces of pound cake into hearts. For the kebab in the center, I drizzled some melted chocolate to add touch of sweetness. 1. Use metal or wooden skewers. 2. Choose your fruit (preferably a fruit that isn't too juicy (or it will saturate your cake, brownies, etc.) or one that doesn't oxidize quickly (apples, pears, bananas). I like to use berries (blueberries, raspberries, strawberries, and blackberries) and grapes. 3. Choose your cake. I like varieties of pound cake (original, chocolate, lemon, or marble) and brownies. They are sturdy and pair well with berries. Slice the pound cake into cubes. 4. Assemble the skewers any way you wish. I like to follow a pattern, but that's the OCD side of me. This is a fun dessert, so no pressure to make them perfect. 5. If drizzling with chocolate, heat chocolate pieces or morsels in a double boiler. I like to add a dash of heavy cream to give the chocolate a sheen. With a spoon, drizzle the chocolate on to the kebabs. * For a fun twist, add a few marshmallows.